Love is the name of the game in this episode of 'Heroes.' Love and finding ones' self, if you really get down to it. Several romances spring up, as heroes test and use their powers for both good and evil. With surprises and a couple of heroes dabbling in the dark side, chapter three of 'Heroes' turns out to be the most thought-provoking yet. The episode starts off with Peter and Scotty where we left them, working out a deal for the box that contains Peter's secrets. In this opening scene, it's revealed that Peter can now read minds just like Matt, exposing fellow Irishman Will's plan to steal the money after the heist they're planning. Not a one of the Irish folk believe him though, and they're left to ultimately see the error of their ways. Maya and Alejandro have made it to a city somewhere in Mexico where they're trying to jack a car to get to America. Because Alejandro doesn't feel like checking for cops before breaking into the car, he gets arrested leaving Maya again by her lonesome. Smooth move, Alejandro. No really, it was awesome. Sadly, a moment of silence is required as we find that D.L. has passed on, leaving only Niki and Micah behind, Niki tearfully convincing Micah that he must live in New Orleans with D.L. 's family while she gets something she needs done. Since it's Niki, it probably has to do with ditching her powers or sleeping with someone. We're hoping for both! We are FINALLY reunited with Sylar! (Applause, please.) At first he appears to be befriended by Michelle, AKA, Candace, who can create illusions with ease. While they first seem to be on a beach, Sylar forces her to take the illusions away, and it's revealed that they are in a cement room with Sylar on a hospital bed all stitched up. Claire and her father have a making up talk, (how sweet!) where she asks what would happen if someone were to find out about her power (West!). He replies that they might have to move, go underground, and forgo jobs and lives completely. Worst case scenario, of course. That's awfully comforting, Daddy Bennet, thanks. West and Claire reunite at school, venom flying as Claire makes up stories about how it only looked like her toe was bleeding because she spilled nail polish on it. Nice cover-up, Claire. Very Nice. Mohinder's back in NYC, with Matt worried that his bringing the fight into their own backyard will disturb Molly more than she already is. Mohinder discounts his advice, saying he can handle it. Yeah, Mohinder. You thought you could handle Sylar too, didn't you? And we all know how that turned out. Hello, Ando! While getting busted playing video games at work isn't exactly helping his career advancement, it does prompt him to get depressed, mess with Hiro's sword and find messages from past Hiro telling him of his adventures with Kensei. That Hiro, he's so adorable!While Peter tries to gain control of his powers in time for the big job, Kaitlyn comes in and assures him that she'll be watching his back and that she hasn't told anyone of his powers. Hello, new and hot relationship. Seriously. Who didn't see it coming? At school, West proves himself to be a horrible person and an all around four-letter word that starts with D and ends with K. Seriously. Calling out Claire as a 'lizard girl' in biology class, he so rattles her that she runs for the exit in tears. Hiro fully realizes that he loves the blacksmith's daughter, but is disheartened because she is destined for Takezo Kensei. Kensei's pretty freaked out by his powers now, but starts getting into the idea when he realizes how much money he could make from it. Hiro is exasperated and teaches him to be a hero the hard way, dumping him in front of a gigantic battle he's meant to fight. Good luck, Kensei! West comes out to talk to Claire after she runs out of class. Obviously, she's upset and crying – not to mention furious when West asks if he's hurt her feelings. Asking him what he wants from her, West replies, only for you to admit you're different. Freaking out, but still very pretty, she replies with her 'I'm a freak.' speech, and if she were found out she'd be carted to a place to be poked and prodded until the end of her days. West tells her to shut up, very romantically of course, picks her up, and whisks her off into the sky. In broad daylight. How very romantic -- and discreet. Mohinder's got a new lab and a new boss. The organization has set Mohinder up in a fancy new place, with brand new equipment that just happens to be in Isaak's old apartment. Nice. Very Nice. Much to his disappointment, they insist that he needs supervision. Hiro and the blacksmith's daughter begin to talk about Kensei -- her doubting him and Hiro praising him (a la Cyrano De Bergerac), when he arrives, carrying the fire scroll she requires. Proclaiming that she'll never doubt him again they embrace. Poor Hiro. Poor, poor Hiro. Niki's giving Micah the 'Bennet' talk. You know, the one about suppressing powers being for their own good. Niki convinces Micah that she has to leave him with relatives so that she can do something she has to do. As usual. Really, I love Ali Larter, but she sure gets weepy at times. We're introduced to DL's mother. It's a freaking 'Star Trek' reunion! Welcome to 'Heroes,' Uhura, AKA, Nichelle Nichols! While Maya's overwhelming guilt at her power previously laced the last two episodes, she seems to embrace it in this one. Going to bail out her brother from jail, the policeman threatens to call the border patrol on her. With an evil, 'I wouldn't do that if I were you,' she announces to the station that they are murderers, and unleashes her power of the black eye goo on the police station. Nice one, Maya! Way to bust out your brother. Alejandro realizes what she's done and reverses it, taking a talkative prisoner with a car along with them. The Irish crew returns home with the money, Will proving Peter correct in his devious plan to rob his kinfolk. Will shoots Peter, but lucky for him, Peter spits the bullets out Wolverine style, pins Will against the wall and is enjoying torturing him and might conceivably have killed him if Kaitlyn hadn't yelled for him to stop. Interesting. Will Peter not stay a Hero? Will he move to the dark side? Back in ancient Japan, Hiro announces to Kensei with much regret that he must leave. But when he sees the face of the blacksmith's daughter Hiro changes his mind and knows it's not time to head back just yet. Go Hiro, get you some! Back in the cement shack that's functioning as Sylar's residence, Michelle offers help to Sylar, who can no longer command his powers. Showing an impressive display of illusion and some tempting options, her offer is rewarded with a coffee cup upside the head. Sylar says that she can help him to restore his powers. Guess what's going to happen next? 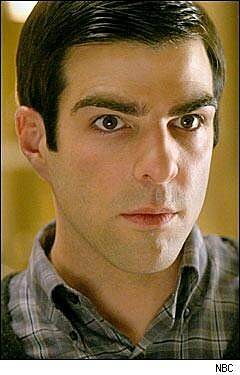 Could we expect anything less from our favorite anti-hero, Sylar? The fly in the ointment for Sylar is that even after stealing her power/brain and revealing her true form he discovers that he can't use it. Has Sylar lost his touch? And where is he? Trees abound as Sylar tries to determine his location and use his powers. Let the romance continue! While Claire and West sit on the beach talking about why each other's power is cooler then their own and kissing like horny teenagers, Claire notices the mark of those taken into the organization on his neck. He relays the story to her of how he got it. West, like the others, lost a day during abduction but remembers the man who took him: 'The guy with the horned-rim glasses.' I don't think I need to spell that out for anyone. Claire's daddy kidnapped West and she knows it. Let the drama begin. Mohinder's every move is being watched by the organization, and he's worried. He gets a brief respite from work when Niki calls the glasses guy, asking if he can cure her. Mohinder makes a startling discovery, a painting by Isaak, showing Bennett shot and dead, while Claire and (I'm assuming) West make out in the background. It's not looking good for Bennet. Guess that Karma thing might actually be true. The episode ends quite poignantly, Bennet agape over the picture predicting his death, while Claire comes up behind him, furious because she knows what he did to West, and countless others. The 'To Be Continued' this week around is bittersweet. Why? Because I want to know what happens NOW! Tune in next week, for more shenanigans from that wacky and lovable 'Heroes' crew. Until then, 'Heroes' fans .... until then.